Aeroquip's AQP Racing Hoses have been the markets most popular racing hoses for over 60 years! Lightweight, flexible and easy to work with, these racing hoses feature a stainless steel braided cover that ensures long lasting durability and excellent abrasion resistance. The elastomer inner tube is resistant to oxidation and provides smooth, uninterrupted flow. Hoses are compatible with petroleum and synthetic lubricants, hydrocarbon fuels and liquid engine coolants. 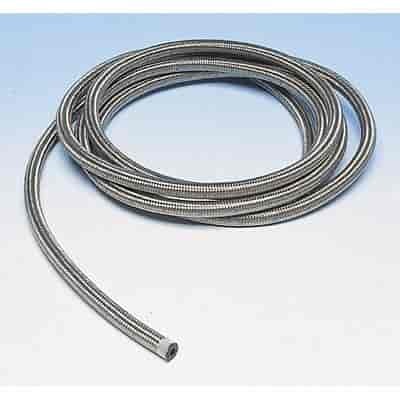 Hoses can operate at higher temperatures for longer periods, ratings of -45°F to +300°F. Works with Aeroquip's aluminum reusable and crimp style hose end fittings. Stainless Steel braided outer cover. Lightweight, flexible, easy to work with. Pressure rating at 1000 psi (sizes -04AN to -12AN). -45°F to +300°F temperature rating. Full vacuum sizes, -10AN, -12AN and -16AN. Works with Aeroquip aluminum reusable and crimp hose end fittings.